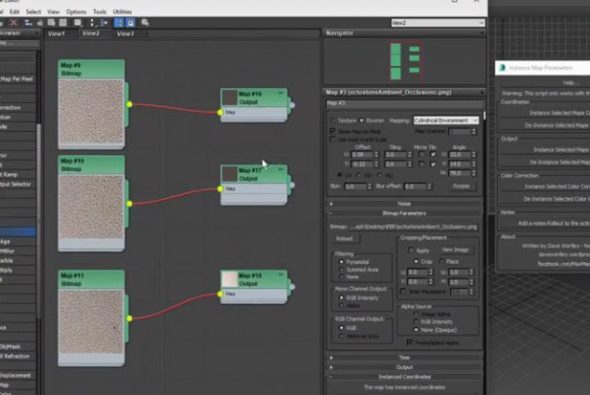 Dave Wortley has released a teaser video of an extremely useful looking new script that uncovers some hidden features of 3DS Max’s slate material editor, allowing users to instance map’s coordinate information. This adds the ability to link tiling, offset, rotation and more. In fact, all the settings found in the Coordinates rollout can be instanced between maps, making it much easier to make changes to multiple maps simultaneously. The script also enables users to instance the contents of the Ouput rollout as well as colour correction nodes. We’ll update this post once the script becomes available, meanwhile you can watch a video presentation of the tool on Dave’s Facebook page, Max Made Easy. Also of interest is a short post explaining how to get around the limitation in Max whereby maps and objects can have the same name, making it tricky to return the selected nodes in the SME. Dave’s solution involves temporarily assigning “each map a unique name, collecting the selection of mats/maps values from the SME, then renaming back to original names.” Read more about it an see a code snippet on the Max Made Easy blog.